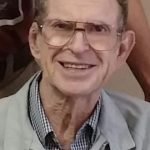 Robert ‘Bobby’ Dean Poynter, resident of Granbury, TX, died January 12, 2019, at age 87. Born in 1931 in Effingham, Illinois, Bobby passed peacefully at Bridgewater Memory Care surrounded by friends due to complications associated with Alzheimer’s. Bobby was a merchant marine back in the 50’s, and married his best friend Shirley in 1954. He became an electrical engineer and started up the first television station in American Samoa. Bobby & Shirley moved many times over the years, had their only child Pamela in 1969, and settled in Houston in the late 70’s. After retiring from television Bobby assisted Shirley with her interior design business. In retirement, they both traveled around the United States in an RV, enjoying hiking, biking and exploring the desert. They settled in Granbury and enjoyed the dear friends they made while living in Lake Granbury RV Park. Bobby is survived by his daughter, Pamela, her husband David, and their three children. He is also survived by nieces Helen, Connie and Luann and by nephews Charles and Floyd. Donations can be made to the Alzheimer’s Foundation of America. So sorry to hear about Bob's death. Spent 3 years in the Effingham (Illinois) high school band sitting in the row immediately in front of him in band practice and concerts -- ducking the slide of his trombone. Many good memories of marching band, concert band, football and basketball game halftime performances, and band contests (local and non-local). You will be missed by many, Bob -- but happy that you and Shirley had a good life together. Rest in peace my friend..